I have been posting spicy recipes for the past couple of weeks and thought I need something to sweeten things up. 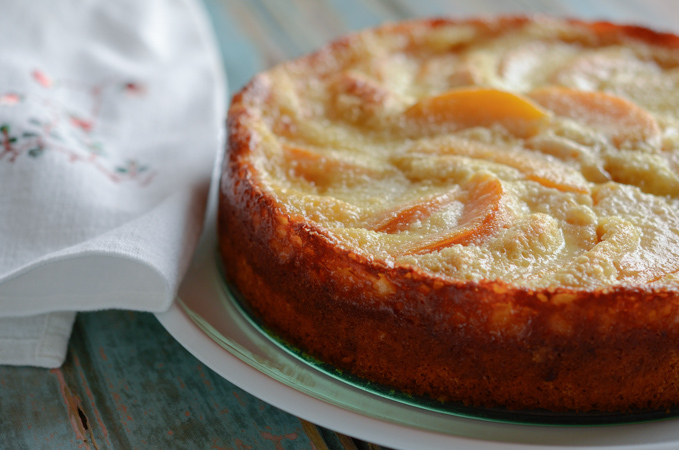 Here is a delicious Peach Kuchen, the German peach cake made with canned peaches. Kuchen is quite an interesting dessert, not to mention how delicious it is. It is like a sort of pie but with tender cake-like crumbs, plus some of them have a delicious and moist custard cream on top. If you taste it, you will fall for it immediately. Fresh peaches would make the most delicious Kuchen for this recipe but I can’t even ask for fresh peaches in the chilly winter in Buenos Aires right now. Here comes canned peaches to the rescue. Besides, they were on sale. Perfect! It is better to use a spring form pan to accomplish the drop-dead gorgeous Kuchen presentation, but it is not mandatory. I am not including the tutorial for this recipe this time because it is very simple to follow from my printable recipe. 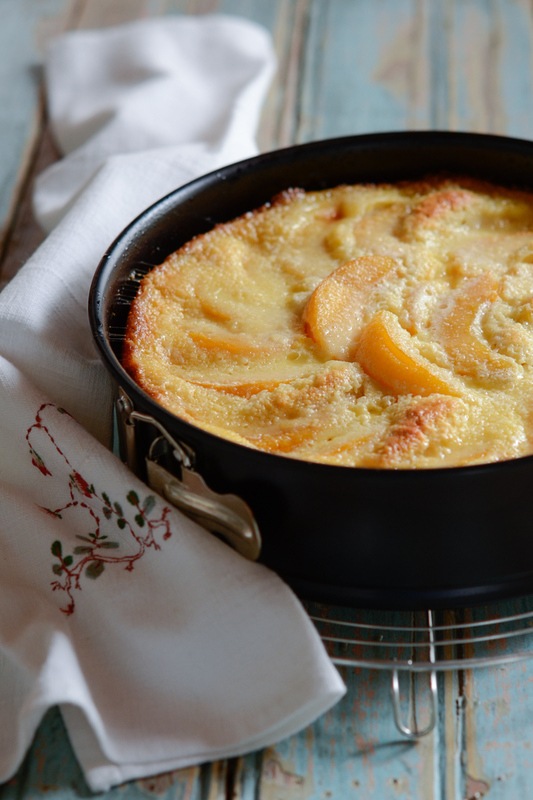 Whether you use fresh peaches or canned peaches, you will end up with a delectable dessert on your plate. 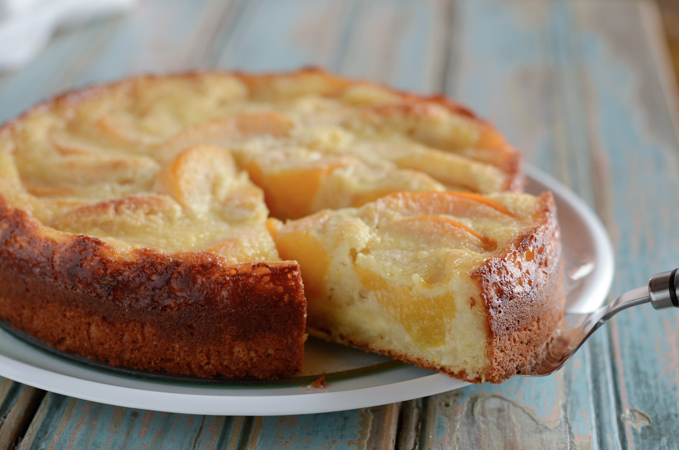 If you have never made Kuchen before, give this a shot! Combine flour, sugar, baking powder, salt, mace in a mixing bowl and stir well with a whisk. Add the cold butter pieces and incorporate to blend well until it becomes fine crumbs. In a small mixing bowl, whisk milk and egg well. Pour the milk mixture over the flour mixture. Mix with a fork just until it becomes wet. Grease a 9-inch spring form pan and spread the batter on the bottom of the pan. Arrange the peach slices on top. Bake in the oven for 15 minutes. 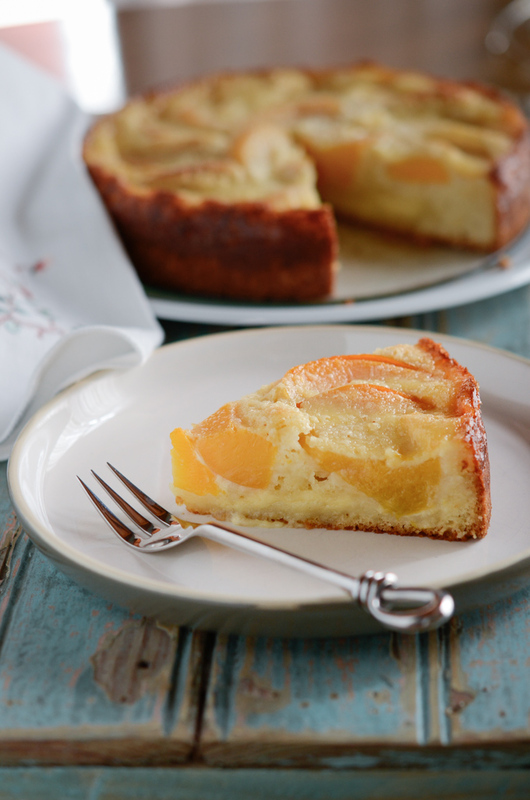 I used canned peaches for this recipe, but you can certainly use fresh peaches. Hi Holly, I have some frozen peach slices, do you know whether I can use them for this cake? It looks yummy. Yes, make sure they are well thawed and drained. Easy Peasy! Love this recipe, the pay-off for little expenditure in time is humongous. Although, required many utensils and bowls for clean-up. Have made it twice and plan to keep in my favourites. Thank you Holly? Thanks Caroline. Glad that you liked this recipe. This looks amazing! I love kuchen, but my grandmother's recipe makes 13! I'll be trying this with apricots. Yum! If I were to make it the day prior to serving it, how would you store the cake? Or, is that not recommended? This cake will stay moist for up to 2-3 days. Thanks. I just made this with fresh peaches and it's so good. If you don't have a spring form pan can this be made in baked in a large cast iron skillet? Looks delicious! Of course. You can use any pan that is oven safe. Good luck! Can the cake bottom recipe be used to make German plum cake as well? I just tried your recipe and the cakes are baking as I type this. I was thinking this could probably also be made with Quark. Can't wait to taste the results. I see why not. It would be lovely together. Hope your Kutchen turned out well. Thanks! I am planning on making the recipe but does anyone know how many it serves? Thank you for this wonderful recipe. I made it last year and it was delicious! Unfortunately, I am now gluten intolerant and have been testing with different flours. if i choose to use fresh peaches how many should i use? 3-4 peaches would be good. Thank you for this delicious cake,I made it with canned peaches and it was very good. Holly , the dish is delicious , however mines is black /burned at bottom. Did I over cook or what did you mean " grease pan"?? 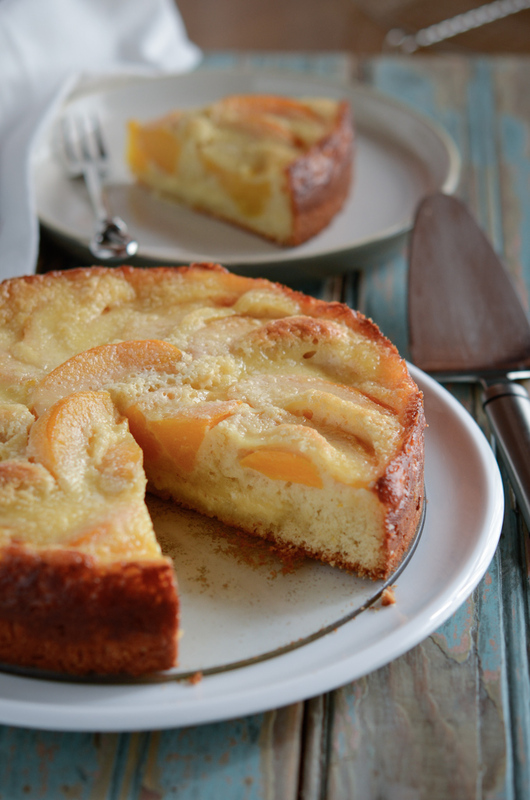 Very good, but I'd call it more of a peach coffee cake than kuchen. Traditional German kuchen has a yeasty crust and, honestly, tastes completely different. The custard should be set like thick custard. If it has the consistency of whipped cream, then perhaps bake a little longer? Did you add the egg by chance? It was wonderfull,i will bake it again,i had fresh peaches,825 gr was a lot!and i think i shouldnt have used all the custard! I wanna try it with other summer fruits! I made this cake and mackerel gogalbi for dinner, my boyfriend who is a "food expert", doubted if these were good then I replied proudly: any recipe from Mrs Holly is excellent! He tried and he almost cried : omg why are these soooo good? He finished half of the cake in minutes :) Thank you Mrs Holly !!! This exact recipe was in Victoria Magazine...that's where I got it from! Love your photo! I used blueberries for this, then I accidentally forgot to turn down the oven to 350 and it baked at 400 for 30 minutes longer. It still turned out great... very forgiving recipe. Tastes delicious! Hi Holly, this looks like a recipe I had years ago and lost. The only difference was if you didn't want to make the custard you could substitute melted vanilla ice cream. I have been trying to find this for years, thank you.